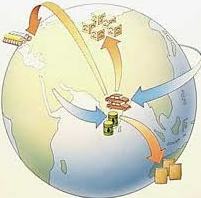 The Foreign Trade Policy (FTP), 2009-14 was announced on 27th August, 2009 in the backdrop of a fall in India’s exports due to global slowdown. The immediate and the short term objective of the policy was to arrest and reverse the declining trend of exports as well as to provide additional support especially to those sectors which were hit badly by recession in the developed world. The Policy envisaged an annual export growth of 15 per cent with an annual export target of US $ 200 billion by March 2011 and to come back on the high export growth path of around 25 per cent per annum in the remaining three years of this Foreign Trade Policy i.e. up to 2014. The long term policy objective for the Government is to double India’s share in global trade by 2020. As an immediate relief, the Government provided a policy environment through a mix of measures including fiscal incentives, institutional changes, procedural rationalization, and efforts for enhanced market access across the world and diversification of export markets. Towards achieving these objectives, several steps were announced in the Policy. Some of the important steps included addition of new markets under the Focus Market Scheme, coverage of Africa, Latin America and large part of Oceania under Focus Market Scheme (FMS) and the Market Linked Focus Product Scheme (MLFPS), increase in incentives available under the Focus Market Scheme from 2.5% to 3% and for Focus Product Scheme (FPS) and MLFPS from 1.25% to 2%, introduction of EPCG Scheme at zero duty for specified sectors, and the grant of additional duty credit scrip to status holders. Focus Market Scheme was introduced by the Ministry of Commerce & Industry in the Foreign Trade Policy from 1st April, 2006. The scheme was introduced to offset high freight cost and other externalities to select international markets and with a view to enhance India’s export competitiveness in these countries. Initially this scheme covered 26 countries, 16 from Latin America and 10 from Asia-Oceania. So far, the Scheme covers a total of 110 markets. The incentive under Focus Product Scheme is 3%. All the countries covered under the scheme are entitled for Duty Credit Scrip equivalent to 3% of FOB value of exports of all products to the notified countries. Free On Board (FOB) is a trade term requiring the seller to deliver goods on board a vessel designated by the buyer.The sellers obligation ends there. DFIA is issued to allow duty free import of inputs, fuel, oil, energy sources, catalyst which are required for production of export product. A minimum 20% value addition shall be required for issuance of such authorization except for items in gems and jewellery sector. DFIA Scheme has been made operational from 2006. Keeping in view the objective of Foreign Trade Policy 2009-14 to promote employment generation in rural and semi urban areas, Vishesh Krishi And Gram Udyog Yojana has been expanded to include export of Agricultural Produce and their value added products; Minor Forest Produce and their value added variants; Gram Udyog Products; and Other Products, as notified from time to time. Duty Credit Scrip benefits are granted with an aim to compensate high transport costs, and to offset other disadvantages. This scheme incentivises export of village and cottage industry products by awarding a duty-free scrip at the rate of 5% of FOB value of exports. The Focus Product Scheme allow duty-credit facility at 2% of the FOB value of exports on 50% of the export turnover of notified products, such as value added fish and leather products, stationery items, fireworks, sports goods and toys, and handloom & handicraft items. Exports of notified products to all countries (including SEZ units) shall be entitled for Duty Credit Scrip equivalent to 2% of FOB value of exports.Egg powder under Special Focus Product is eligible for benefits @ 5% of FOB value of exports to all markets.Foe some products Bonus Benefits @2% of FOB value of exports is also granted. So far, over 1000 products have been covered under the Scheme, which include leather products and footwear, handloom products, handmade carpets and other textile floor covering, handicrafts, coir and jute products, technical textiles, engineering products, green technology products, electronic products, etc. To give significant boost to market penetration of specific product in specified markets, a variant under Focus Product Scheme called Market Linked Focus Products Scrip has been introduced from 1.4.2008. Export of products / sectors of high export intensity / employment potential (which are not covered under present FPS List) would be incentivised at 2% of FOB value of exports (in free foreign exchange) under FPS when exported to the Linked Markets (countries), which are not covered in the present FMS List. Presently the products covered under the scheme include motor vehicles, auto-components, bicycles and parts, apparels, knitted and crocheted fabrics, pharma products, value added plastic and rubber goods, glass products, dyes and chemicals, household articles, machine tools, earth moving equipments, transmission towers, electrical and power equipments, steel tubes, pipes and galvanized sheets, compressors, iron and steel structures, auto components, Three wheelers and cotton woven fabrics etc. The countries covered under the Scheme include Algeria, Egypt, Kenya, Nigeria, South Africa, Tanzania, Brazil, Mexico, Ukraine, Australia, New Zealand, Cambodia, Vietnam, Japan and China. There are over 3500 products so far covered under this scheme. At present, there are two EPCG Schemes, that is, 3% concessional duty EPCG scheme and Zero duty concessional EPCG Scheme. 1. The scheme allows import of capital goods for pre-production, production and post production as well as for computer software systems subject to an export obligation equivalent to 8 times of duty saved amount ( 50% of Export Obligation in case of import of spares), to be fulfilled in 8 years reckoned from Authorization issue-date. 2. To encourage exports from the tiny and cottage sector, an export obligation period of 12 years is granted for fulfillment of export obligation. 3. In case of agro units, the export obligation is equivalent to 6 times duty saved on imported capital goods to be completed within a period of 12 years. The scheme has been introduced in the new Foreign Trade Policy 2009-14 for specified sectors, viz for exporters of engineering & electronic products, basic chemicals & pharmaceuticals, apparels & textiles, plastics, handicrafts, chemicals & allied products and leather & leather products, paper & paperboard and articles thereof, ceramic products, refractories, glass & glassware, rubber & articles thereof, plywood and allied products, marine products, sports goods and toys added. The zero duty EPCG Scheme will be in operation till 31.3.2012. 1. Under zero duty EPCG Scheme, export obligation equivalent to 6 times of duty saved amount on capital goods is required to be fulfilled in 6 years from authorization issue date. 3. Export obligation period of 6 years can be extended for a maximum period of 2 years only. Government of India has introduced "Served from India Scheme" to facilitate exporter of various type of services. The objective of this scheme is to accelerate growth in export of services so as to create a powerful and unique 'Served From India' brand, instantly recognized and respected world over. Under this scheme, Service Providers of more than 100 services like Professional Services, Computer Related services, Hotels, Restaurants, Educational Services, Research and Development services, Communication Services, Construction and Related Engineering Services, Distribution Service, Environmental related Services, Tourism and Transport related Services, Health Related Social Service, Recreational, Cultural and Sporting Services etc are entitled for Duty Credit Scrip equivalent to 10 per cent of foreign exchange earned during the current financial year. Service providers, who have a total foreign exchange earning of at least Rs.10 Lakhs in preceding or current financial year shall qualify for Duty Credit Scrip. For Individual Service Providers, the criterion is reduced to Rs.5 Lakhs of foreign exchange earnings. 20 Jan 2011 : SFI Scheme: Incentives to IT, other services exporters withdrawn. In a move that will adversely impact the country's services sector, the government has withdrawn incentives to exporters of IT and ITeS, telecommunication and airlines services.